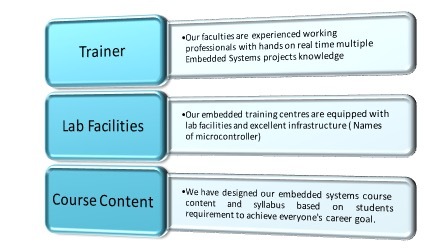 We offer Embedded Courses for individuals who wish to make a career in Embedded Systems while ensuring a complete practical exposure during their learning process. Our embedded course includes basic to advanced level and our embedded systems course is designed to get the placement in good MNC companies as quickly as once you complete the training course. Technology evolves at a faster pace. The main intention of the courses is not only to teach a certain skill, but to induce a self-learning skill, that can enable you to learn new technologies faster and stay with the trend.